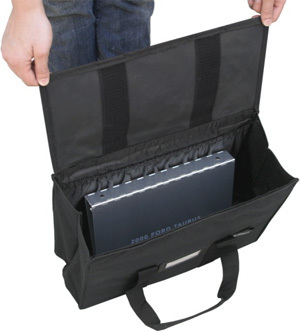 This new and innovative carrying case opens at the top and expands six inches, making it easy to load and remove bulky items. Expands to fit framed artwork, print boxes, bulky samples and more. Collapses to hold flat materials. Closes with a Velcro-secured flap over the top. 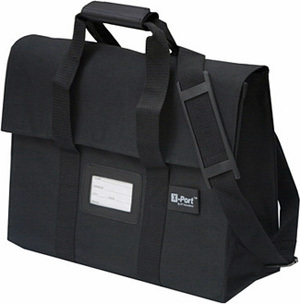 Features a leatherette hand grip, business card window, two inside pockets. Made from water-resistant 600-denier polyester with corrugated plastic stiffeners, its rugged construction is backed by a two-year warranty.